As the low-carb trend is starting to reveal the health benefits of diets that restrict carbohydrates, many are left to wonder if going completely no carb would provide more impressive results. While a no-carb diet is ketogenic and it does have many of the same health benefits as a low-carb diet, but it becomes even more important than ever to count your macros if you do find yourself on the no-carb train. The no-carb diet may also be more beneficial for those who plan to maintain the diet for only a short period of time. Glucose is essential to life. 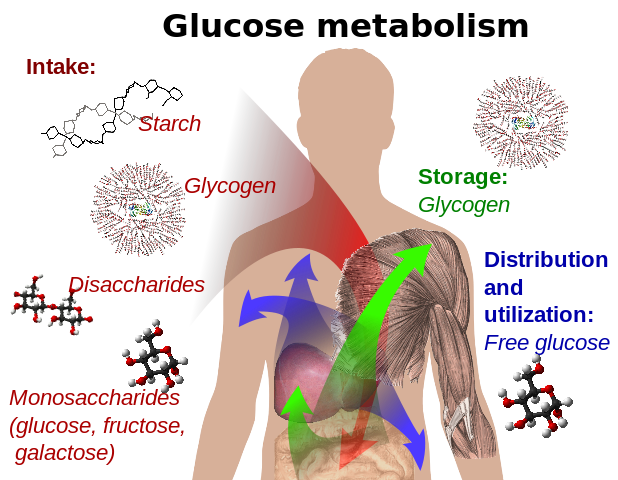 The body can extract glucose from carbohydrates or it can create glucose using a process known as gluconeogenesis. The American Heart Association (AHA) Nutrition Committee states that a limit of 10 to 20 grams of carbohydrates a day is not enough to prevent the loss of muscle tissue. However, the AHA is wrong. There are certain hormonal changes that occur with a low carbohydrate diet. Namely, insulin levels are reduced and glucagon levels are increased. Through a complex series of reactions, the process of gluconeogenesis is activated. When the body undergoes a very low carb diet, the body begins to produce ketones. Since ketones can't be used by the liver to because it lacks the right enzymes, the ketones get transferred to the brain and other organs outside of the liver to be used as fuel. This results in a sparing of glucose through the oxidation of fatty acids, which essentially results in an alternative fuel by the body. On average, the body can create its own glucose, but it needs approximately 1.6 grams of amino acids per day to create 1 gram of glucose. This means the brain would need from 160 to 200 grams of protein per day to supply the brain with the 110 to 120 grams per day requirement of glucose. However, this is not how the body works. Rather than requiring a massive amount of protein, the body simply reduces the amount of glucose that is required and uses ketone bodies for fuel. The need for gluconeogenesis is reduced and muscle tissue is spared. In fact, ketone bodies are the preferred source of energy for most organs outside of the liver (non-hepatic), and it will utilize them whenever ketones surface in the blood. On a low-carb diet, there is a blood-brain barrier transporter that promotes the use of ketone bodies for energy. This transporter well exceeds the energy demands of the body. Provided you eat well on a low-carb or no-carb diet, the brain will always have enough fuel. Also, because there is a low amount of insulin in the blood from the lack of glucose, the glucose that is required by tissues outside the brain is only partially broken down. This excess can be recycled, and the cells and tissues that need glucose are not actually depleting the body of necessary glucose. Researchers have found that extremely low-carb diets result in a significant decrease in fat and an increase in lean body mass. The current recommendations for carbohydrates are based on two important factors. 1) The desire to prevent ketosis. 2) Preventing excess glucose from causing a surge in insulin. When you begin to look at the literature, you'll find that there is a strong bias towards ketogenic diets. However, numerous studies have found that ketogenic diets are healthy and even desirable for weight loss and a strong body. The only time where ketosis actually becomes harmful is when an individual has type 1 diabetes and enters a state of diabetic ketoacidosis. Strangely, with all the emphasis on carbohydrates in our diet, the National Research Council never determined the Recommended Daily Allowance of carbohydrates that are needed to support life. Since the body can survive just fine on a carbohydrate-free diet by creating its own glucose, there is no need for a recommendation. While many nutritionists and doctors cite the need for carbohydrates, there is no real research to back these statements up. Many of the fears associated with a low-carb or no-carb diet stem from the untested belief that a high-fat diet will create a condition known as hypercholesterolemia. Essentially, excessive levels of cholesterol in the blood. However, when people on a low-carb or no-carb diet are tested, the levels of total cholesterol, HDL cholesterol, LDL cholesterol and triglycerides are typically improved. Most notably, triglyceride and HDL levels are improved the most. In contrast, high-carbohydrate diets have been shown to reduce the levels of HDL and raise the levels of triglycerides. This leads to an increased possibility of insulin resistance syndrome, which can lead to type 2 diabetes. Additionally, fat raises the levels of the good HDL-cholesterol while carbohydrates reduce the levels of HDL. With the results of recent studies showing that increased carbohydrate levels can lead to type 2 diabetes and coronary heart disease (CHD), it's time to rethink the value of carbs. Low carb diets go back as far as 1860 and possibly even further. In 1860, William Banting discovered that avoiding starch and sugar resulted in increased weight loss. He lost 45 pounds in just a few weeks. In fact, he even wrote about it in his "Letter on Corpulence." Most of the studies since then have been relatively short-lived. In 1939, two Danish scientists decided to trial a low-carbohydrate diet resulted in the participants only able to maintain their energy levels on a stationary bike for 81 minutes while the high-carbohydrate diet resulted in individuals going for 206 minutes. The diet only lasted a week. A more recent study in 1980 by Stephen Phinney tested a longer lasting diet where energy levels did wane at the beginning of the diet, but in week six, their level of performance had greatly improved. This was one of the early studies that signaled a low-carb diet is effective if given enough time for the body to adapt to the ketogenic state. Another famous case that is often used to cite the benefits of the low to no-carb diet is based on an Icelandic-Canadian explorer by the name of Vilhjalmur Stefansson who lived from 1879 to 1962. He lived with the Inuit for a period of time and noticed their diet included minimal carbohydrates. Criticism of this diet is fair since the diet actually uses 15-20 percent of the total calories from carbohydrates. However, he later volunteered to run a one-year experiment in a hospital and lived on nothing but protein sources with no carbs. It's important to note that he intentionally included meat sources like raw brain and liver that contained a significant source of vitamin C.
From a practical standpoint, high-carbohydrate diets made it possible for humans to evolve and travel. When animal sources no longer became the main source of fuel, we were able to produce more food with less effort. In truth, there is plenty of evidence to suggest that a carbohydrate-based diet is intended only to provide short-term energy in order to make it possible to hunt and secure more protein-friendly meals. Here is where things start to fall apart for the no-carb diet. While you can eliminate carbohydrates from your diet and be fine for several months, the body eventually needs to get some much-needed micronutrients into the system. The body is able to store many vitamins and minerals in tissue. These reserves build up over a lifetime and they can be used when nutrients are depleted. Eventually, you will need to eat some carbs to ensure you're getting the minerals, vitamins and antioxidants you need to live a healthy life. In a 2010 study published in the Journal of the International Society of Sports Nutrition, researched examined four common diets to discover if they were providing the basic levels of micronutrients needed for survival. The Atkins diet, which is low in carbs was amongst the diets studies. The team of researchers discovered that out of 27 micronutrients that the diet tested for, all four of the diets came short. The most prevalent shortages came in the form of vitamin B7, vitamin D, vitamin E, chromium, iodine and molybdenum. These essential nutrients ranged from existing in very low to no amounts across all of the diets. For your own reference when looking for a multivitamin supplement, the following micronutrients were evaluated in the study: Vitamin A, thiamine, riboflavin, niacin, pantothenic acid, vitamin B6, biotin, folate, vitamin B12, vitamin C, vitamin D, vitamin E, vitamin K, choline, calcium, chromium, copper, iron, iodine, potassium, magnesium, manganese, molybdenum, sodium, phosphorus, selenium and zinc. Without the right level of micronutrients, you may be damaging the cells of your body and preventing many of the critical systems from functioning as intended. By maintaining even a modest amount of carbohydrates, you're more likely to get close to your micronutrient goals. However, the main reason to take in a lot of carbohydrates is to ensure you get primarily food-based sources of the minerals, vitamins and antioxidants you need. By sticking to a low-carb instead of a no-carb diet, you can get some powerful antioxidants from berries and other fresh fruits and vegetables. A multivitamin supplement can also help to protect you against the dangers of low micronutrients. Free radicals are dangerous to the body, and you need to get the right amount of antioxidants in your food to protect against them. What's even more worrisome is that a 2009 study using data from the National Health and Nutrition Examination Survey showed that supplements may not provide an effective way to get your nutrients. Some studies suggest that using high-dose beta-carotene supplements may be correlated to a risk of lung cancer if you're a smoker. So, if you smoke, it's time to quit. High-dose vitamin E supplements are linked to an increased risk of stroke and prostate cancer. The jury is still out on the effectiveness of antioxidant supplements with some studies suggesting a benefit and others stating they are harmful. In a massive undertaking by the National Institute of Health, several studies were conducted to determine the long-term effects of antioxidant supplementation. In The Women's Health Study, which included about 40,000 women, vitamin E supplements didn't help with the rate of death from heart attacks, but they did show a reduction in deaths from cardiovascular disease. Other studies resulted in similar results in relation to vitamin E, selenium, vitamin C and beta-carotene supplements. Of course, the problem with these studies is that they were conducted to determine if taking supplements could cure or prevent disease. The study did not test whether or not the body could survive solely on supplementation. One glimmer of hope lies in a study that shows adding lutein and zeaxanthin to an omega-3 fatty acid supplement was beneficial for those who consumed small levels of these nutrients in their food. The issue seems to come down to a problem of quality and quantity. Researchers don't know for certain why supplements don't work, but they have quite a few theories. One theory is that the health effects of antioxidant-rich foods may actually be caused by some other substance in the food that is not being detected. Another option may be that large doses of antioxidants are simply not better for you. The chemical form of the antioxidants in supplements may not be well-suited to absorption by the body. There is also a theory that free radicals aren't as harmful to the body as we think. The relationship between any process in the body is extremely complex, and it's possible that free radicals can be beneficial in some ways and eliminating them could cause negative effects on our health. It's also possible that there simply wasn't enough time for the body to fight the disease since many chronic diseases take decades to develop. The people in the studies were also not considered to be healthy. This puts them at a disadvantage that a healthy person may not have to overcome. The only real drawback to a zero-carb diet is that you can't guarantee that you'll get all of your nutrients from a no-carb diet. This is why it's important to supplement in moderation and carefully choose the carbs that you do integrate into your diet. With a moderate supplementation plan and some nutrient-rich foods, there is no reason why you can't maintain a low-carb diet for an extended period of time. A no-carb diet should be reserved for limited timeframes when a very specific goal is desired.